Our vocation can be summarised with these three words: Together for Europe. The word “Together” contains the whole Gospel: respect, welcome, love for one’s neighbor to achieve a reconciled relationship based on the pact of mutual love. “For” means that our pact has a purpose which is “Europe”. Twenty years ago the pioneers of this ecumenical network declared: “we wish to serve the cause of politics by giving Europe a Christian soul”. The Friends of Together for Europe meeting in Prague in November 2018 was an illustration of this. We met together from many different parts of the continent to put dialogue and mutual acceptance in practice and listen to Czech experts who helped us get to know the Czech Republic from a political, historical and ecclesiastical perspective. Participating in the anniversary celebrations of the “Velvet Revolution” also proved to be the catalyst for making everyone feel more European at the end of the meeting. Czech, German, French, Russian, Italian, Slovenian and Austrian, but also European. Europe is waiting for us to show them that unity in reconciled diversity is possible. The journey that Together for Europe has travelled and its 20 years of history are the repositories of this experience. It is a way of life. The more we give of ourselves to other people, as Slovaks, Romanians, Swiss etc. with all our cultural treasures, the more European we become and vice versa. It is an auspicious path to follow where unity and diversity go hand in hand. The 9th of May, Europe Day, European Union Day, is also waiting to be supported by these values. The great polyphonic choir of Europe is waiting to hear the voice that says: “Europe’s future lies in a culture of Togetherness”. The forthcoming elections to the European Parliament are calling on us to be the protagonists of this moment. The six-week journey of prayer taking us from 25 March to 9 May is an opportunity to go into depth with this vocation. The following thoughts and contributions from various people can encourage us to find the gestures, traditions and methods best suited to our cultures to help those who have come TOGETHER FOR Europe to be heard across Europe. beyond the borders of countries, nations or ethnic groups. It represents a European people in the making. This is the space for the people of Europe: where experiences from different parts of Europe, testimonies of togetherness from the Movements and Communities from different Churches and cultural contributions can be shared forming a mosaic in the coming weeks that speaks of a new Europe. Prayer achieves things that little else can achieve. It brings us together, directing us, the Created towards the Creator, the Father. Praying together makes us children, brothers and sisters, in communion with one another and with God. 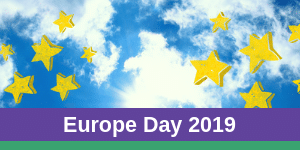 .To see contributions from “Europe Day 2018”.